I didn't have many toys. I had a doll which had lovely hair I loved combing it and dressing it. We had a rocking horse which we had to share. We often had a row over who should have it. 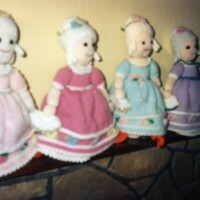 A photo of four handmade dolls with smiley faces. 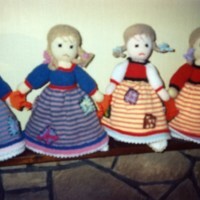 A photo of four handmade dolls with sad faces.